We have produced a new poster in association with Swan River Press, to celebrate the work of twelve Irish writers of fantasy, from Charles Maturin to Mervyn Wall. Ask in your local Dublin City library branch for a free copy! Fitz-James O’Brien was born in Cork on 25 October 1826. Little is known of his early life, though he attended Trinity College and, after a short period in London, emigrated to America around 1851. In New York he joined the artistic Bohemian set, and began writing for various magazines, including Harper’s, Vanity Fair, and Atlantic Monthly. At the outset of the American Civil War in 1861, O’Brien joined the New York National Guard. He was wounded in February 1862, and later died of tetanus on 6 April. His most notable stories and poems were collected in 1881 by his friend and literary executor William Winter. O’Brien’s proto-science fiction stories, such as “The Diamond Lens” and “What Was It?”, are now considered landmarks of the genre. 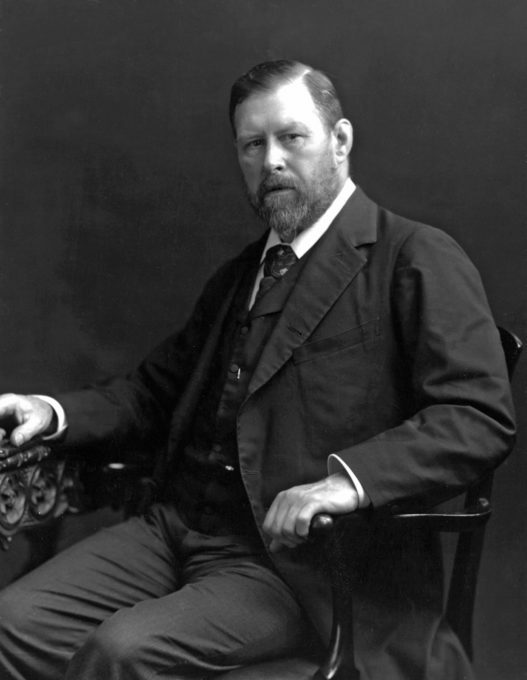 Bram Stoker (1847-1912) was born in Clontarf, Dublin, and educated at Trinity College. As a young man he worked as a civil servant at Dublin Castle, and as an unpaid theatre critic for local newspapers. He is best known today for his classic horror novel Dracula (1897), but during his lifetime he was known as the personal assistant of actor Henry Irving, and business manager of Irving’s Lyceum Theatre in London. Other notable works include The Jewel of Seven Stars (1903), Personal Reminiscences of Henry Irving (1906), The Lair of the White Worm (1911), and the posthumously published collection Dracula’s Guest and Other Weird Stories (1914). Lord Dunsany (Edward John Moreton Drax Plunkett; 1878-1957) published his first collection, The Gods of Pegāna, in 1905. He followed this with more than sixty volumes of critically acclaimed stories, novels, plays, poems, and translations. A big-game hunter and a sportsman, Lord Dunsany was also a soldier and a highly ranked chess-player; and was the Byron Professor of English Literature in Athens in 1940-41. He was nominated for the Nobel Prize for Literature in 1950. James Stephens was born in Dublin in 1880. Like many young Irish poets of the early twentieth century, Stephens started his career under the tutelage of A.E. ; he dedicated his debut poetry collection, Insurrections (1909), to his mentor. In Irish Fairy Tales (1920) and Deirdre (1923), Stephens explored the myths and legends of Ireland. His best remembered books are his Dublin novel The Charwoman’s Daughter (1912) and the philosophical fantasy The Crock of Gold (1912). He died in England in 1950. Dorothy Macardle (1889-1958)—historian, playwright, journalist, and novelist—was born in Dundalk, Co. Louth. She was educated at Alexandra College in Dublin where she later lectured in English literature. She is best remembered for her seminal treatise on Ireland’s struggle for independence, The Irish Republic (1937), but also wrote novels of the uncanny, including The Uninvited (1941), The Unforeseen (1946), and Dark Enchantment (1953). She died in Drogheda and is buried in St. Fintan’s Cemetery, Sutton. C.S. Lewis (1898-1963) is widely considered a titan of twentieth-century fantasy, due largely to his “Chronicles of Narnia” novels (1950-56), which commenced with The Lion, the Witch and the Wardrobe. Though born in Belfast, Lewis is more often associated with Oxford, where he joined the Magdalen College English faculty, and associated with J.R.R. 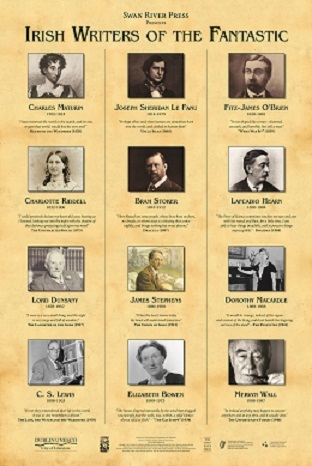 Tolkien and other members of the Inklings literary group. Lewis also explored science fiction in his “Space Trilogy” novels (1938-45), while Christian themes permeate works such as The Screwtape Letters (1942). Lewis is buried at Holy Trinity Church in Headington, Oxford. Elizabeth Bowen (1899-1973) was born in Dublin. In 1930 she inherited the family estate in Bowen Court, in Co. Cork, where she entertained the likes of Virginia Woolf and Eudora Welty. Her novels, non-fiction, and short stories—such as those in The Cat Jumps and Other Stories (1934) and The Demon Lover and Other Stories (1945)—continue to be read and appreciated today. Her ghostly fiction, which made regular appearances in the anthologies of Cynthia Asquith, is akin to that of Henry James in its psychological probity, but briefer, wittier, and more ironic, with a streak of feline cruelty. Information compiled by Brian Showers of Swan River Press.